“Manda-la in Hiroshima” was shown as a first film at 9:30am on November 21st. This film was a documentary that showed until the picture “Manda-la in Hiroshima” was completed. When the film finished with the message “This movie is dedicated to the Hiroshima 70th“, the audience seemed that they were deeply touched by the film. 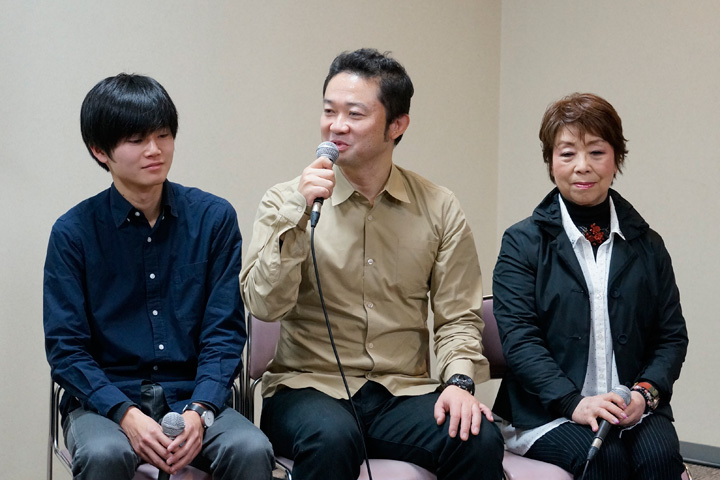 Then the talk show was started with Mr. Masahiro Usami (Photographer), Ms. Yuriko Hayase (survivor of the atomic bombing), and Mr. Kazuma Kuramasu (Director). It was precious dialogue with key persons in this film. The interviewer asked what opinion they had had when they had started this “Manda-la Project”. The title of the picture, “Manda-la”, named after Buddhist painting “Manda-la”, has characteristics which were putting the main character in the center and the people and things representing the main character’s world in the surrounding. Mr. Usami said that this project was started from his graduation work. He confessed, “I took pictures of my friends’ houses as my graduation work because it was easy.” The turning point was the Great East Japan Earthquake on March 11th in 2011. He told how this changed his mind and his works since the earthquake happened and what brought him from Fukushima to Hiroshima. He wanted to find out the heart of Japan. Ms. Yuriko Hayase, who was a key person to make this picture in Hiroshima, became a survivor of the atomic-bombing at the age of 9. She told how she met Mr. Usami and what she was feeling in the process of participating in the project as a survivor while thinking back on the scenes of the film. Then the interviewer focused on Mr. Kuramasu who was the director. Surprisingly, this was the first film in his life. When the interviewer asked a question about what made him make the film, Mr. Usami answered on behalf of Mr. Kuramasu, “At first, he didn’t even know how to record and the video was blurred!” Mr. Usami also mentioned that this film was secondary work which came from the in process recording of the work. So, Mr. Kuramasu also wasn’t aware of making film. Mr. Kuramasu told that he was a just an observer at first, but his consciousness was changing as he was making the film. His story was so vivid that the audience listened closely to him. Ms. Hayase said over and over that this project was a miracle. We could feel that the picture and the film describing the process of making the picture “Manda-la in Hiroshima”, both were precious works in this talk show. The audience gave a generous applause to them at the conclusion of the talk show.